Caught in the act of laying the last eggs of autumn, this lady displays her magnificent wheel. Last week Bug of the Week received inquiries from viewers regarding large scary bugs loitering on sunny sides of buildings. Photographs sent via cell phones confirmed my suspicions that these large bugs were wheel bugs, awesome assassins of the insect world. The common name, wheel bug, stems from the fact that this terror has a structure on its back that looks like some spoke-bearing medieval torture wheel. The function of this wheel is known to Mother Nature and the wheel bug but not to me. The business end of the wheel bug is the powerful beak or proboscis that is stored between the front legs of the beast when it is not in use. When the wheel bug spies a tasty morsel such as a tiger moth caterpillar, it cautiously approaches, embraces the mark with its long front legs, and impales the victim with its powerful beak. The beak is used to pump strong digestive enzymes into the victim. These enzymes liquefy the prey’s body tissues. A pump is activated in the head of the wheel bug and the liquid meal is slurped up through the beak. The wheel bug belongs to a family of insects commonly refereed to as assassin bugs. 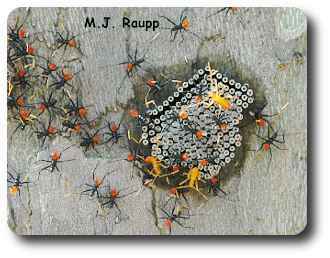 Assassin bugs are some of the most important beneficial insects in our gardens. They feed on a wide variety of pests including caterpillars, plant hoppers, sawfly larvae, aphids, and beetles. Bright red abdomens and orange antennae deck out jazzy assassin bug nymphs as they hatch from their eggs. n autumn, the well-fed female wheel bug lays 10-40 barrel-shaped eggs in a cluster, usually on the bark of a plant. Eggs hatch the following spring in May and June. The small wheel bugs, called nymphs, are magnificent creatures with bright red abdomens and orange antennae. They eat small insects. 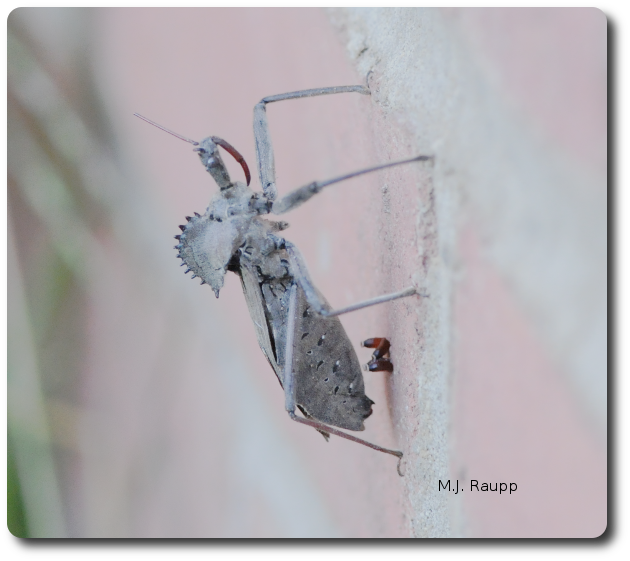 A relative of our local wheel bug called the kissing bug is found mostly in the southwestern US and in Central and South America. Kissing bugs have the interesting nocturnal habit of feeding on exposed skin of animals including the lips of people as they sleep. Here in the United States this usually causes little more than a minor skin irritation. However, in Central and South America, kissing bugs in the genus Triatoma carry a serious and sometimes fatal disease called Chagas disease. Can the wheel bug cause any wheel harm to us? It depends. One pet wheel bug in our laboratory, Assasi, intrigued us for several weeks with her sly and deadly antics. However, careless handling of this little beauty resulted in a memorable painful poke from her beak. If you keep wheel bugs as pets - beware! Try not to handle them directly or you may become the victim of this clever assassin.